There was remarkably very little furniture apart from coffers and stools in England and France throughout the middle ages. The only form of table was a long plank of wood laid unsecured across some form of supporting trestle which allowed them to be set aside and stored when more space was required for other purposes. These trestle tables almost always in oak, elm or ash, were of communal or family use in the great halls of castles or churches, hence the term Refectory or Monastery Table given to them. As time moved on trestle tables became a static feature allowing the top to be fixed to the trestle, a stretcher was added between the trestles to give stability to table. In the past refectory tables had been rustic, thick top, rough –hewn planks covered in cloth but in Elizabethan times this was removed and polished wooden surfaces became fashionable. Shaped, end slabs of wood attached to sledge feet supported the tops, carved detail was added to enhance the oak tables. In the sixteenth century the design evolved into a single pillar joined into a sledge food and supporting top bearer, in turn connected to a corresponding pillar or pillars by a stretcher, secured by removable tapered pegs made in Ash or Elm both woods being impact resistant timbers. 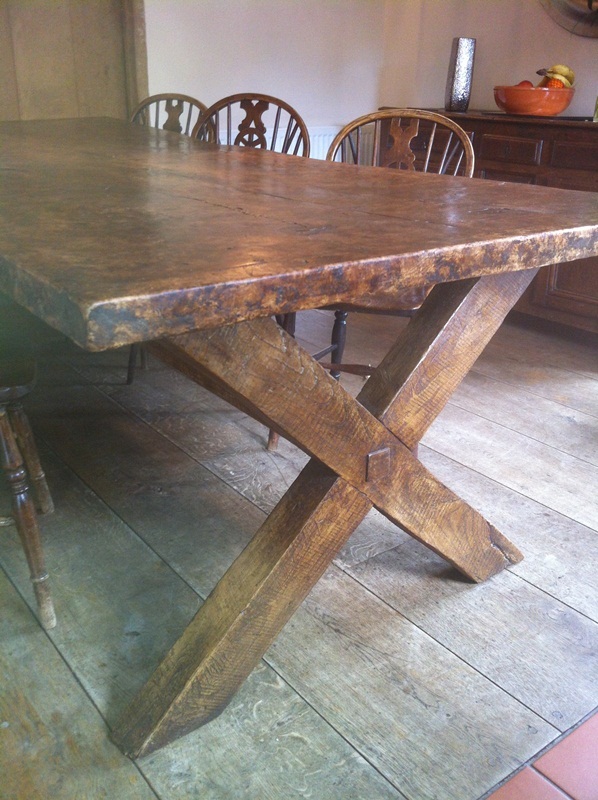 The development of efficient frame joinery led to an alternative method of construction of country tables. A mortise and tenon joint held together by Oak or Willow dowels, four upper rails connected to the legs made the upper frame. In turn Low stretchers on all four sides connected the base of the legs . In later years the lower side rails were replaced by a centre stretcher (H-stretcher) and eventually all stretchers were dropped from the structure altogether. Only in the seventeenth century did large dining tables start to appear amongst the general population. Increasing numbers of households began to furnish their properties with English farm house tables, benches, Windsor chairs, servers, buffets, oak dressers, side tables, gate leg tables, and occasional tables, accompanied them. Tavern tables with X Frame stretchers along with three leg cricket tables, Windsor chairs furnished the ale houses. Harvest tables and convent tables were used to furnish village meeting halls. At first the provincial tables were simple and rustic with square chamfered legs then when Lathe turning was mastered by the local carpenter and joiners, simple round turned leg, bobbin, twists and baluster shapes were all used for decoration. Single and double drawer leaf table designs were introduced from France and Italy along with tapered leg kitchen tables. Most of the early refectory tables were made in Oak, Ash or Elm, but examples of Chestnut, Walnut, Pear, Apple, Cherry and other fruitwoods are all to be found especially in France where French Farmhouse tables were made using all the local woods. Elm and Beech Normandy tables came from Northern France, Chestnut and Oak tables in Brittany, Walnut Banquet and Chateau tables to the south and Pine in the Alps. Styles and construction of French Country Furniture were very regional. As you can see today in examples of French provincial antique tables, they have remained unchanged and simple in design for centuries. Some have included bread slides, extension leaves, large drawers to replace dough tables. H-stretchers and end stretcher bases were added for stability. Thick chunky legs with canted corners, delicate tapering or cabriole legs are all incorporated into their designs. Many of the antique tables found today were made for outside use. Wine tasting tables and Harvest tables were taken to the fields outside the French farmhouse where the workers would sit on French benches or sets of ladder back chairs, some with cabriole legs, to eat their lunch. Many of these old French tables were made so well and with such quality that they have gone onto survive through the generations to become Antique Tables today.